Are you looking for long-term allergy relief? There are more than 50 million people just in the U.S. that suffer from nasal and respiratory allergies and it’s the 6th leading cause of chronic illness. In this post, we’ll answer that exact question so you can decide if buying an air purifier is a smart choice or not. We’ll first start with the short answer to give you a glimpse of what’s ahead, then we’ll move onto the detailed explanation so you can fully understand what your best options are for getting relief. 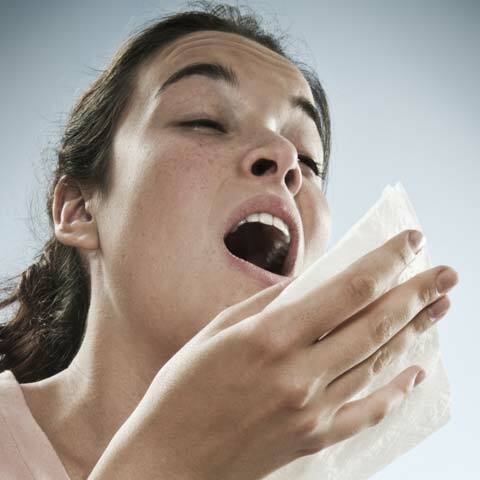 Yes, an air purifier can help with allergies as long as it uses a True HEPA filter. This filter is the only kind that can remove 99.97% of allergens as small as 0.3 microns in size which includes pollen, mold spores, pet dander, dust, and other microscopic allergens. If this is what you’re looking for, you can check out our review of the best allergy air purifier. Before we answer the question about can air purifier help with allergies or not, it’s good for you to know what may be triggering your indoor allergy symptoms. Not all allergies are caused by the same thing(s). Some people have a hypersensitivity to one type of allergen while others are aggravated by multiple particles inside the home. Since these things are found in virtually every home, it makes sense why so many people experience year-round allergies. Additionally, these particles can’t be seen by the naked eye and it’s often hard to tell which one (or more) is the root cause of your allergic reactions. Therefore, it’s best to protect yourself against exposure to all types of allergens and not take any chances. So, can an air purifier help with your allergies? We’ll tackle that question next. Second, Will Air Purifier Help With Allergies? The problem with indoor allergens is that they float around your home and eventually make their way into the carpet, bedding, drapes, upholstery, and your clothing. And every time you walk across your floor, lay down, or disturb one of these areas, it sends the trapped allergens back into the air for you to breathe in. That’s why your allergies often flare up out of the blue. The good news is that an air purifier can give you relief for your symptoms. If you choose the right air purifier, it can clean your home’s air of a large portion of the allergy triggers we mentioned above. These devices can also get rid of odors which are another thing that can irritate your sinus and respiratory tracts and make you feel worse. However, there are are some things you need to keep in mind before making a purchase. The truth is that not all air purifiers are designed the same and not all are great at helping with allergies. In fact, if you don’t buy the right kind of air cleaner, you won’t experience any allergy relief while at home. The secret to getting the best air purifier for allergies is to find one that’s equipped with a True HEPA filter. This filter is specially designed to catch and trap 99.97% of microscopic allergens down to 0.3 microns in size. That’s 7x smaller than a human hair. Just buying an air purifier with a True HEPA filter is not enough. You need to make sure that the device is sized correctly for the room you want to use it in. If the air purifier is not powerful enough, then it won’t be efficient at removing indoor allergens and you’ll still feel awful at times. To get the right size air purifier, all you have to do is figure out the square footage of the room you’ll be placing it in and match it up to a product that will cover that size space. Most manufacturers list this room coverage rating on the device so you can quickly determine if it’s the right fit. Simply measure the length and width of the room. If it ends up being an odd length, round it to the nearest whole number. Then, multiply these two numbers together to get the total square footage. For example, if you have a room that’s 31.7 feet long by 26.2 feet wide, you would round these numbers up to 32 feet long by 26 feet wide. Multiplying those two numbers together (32 x 26) gives you 832 square feet. When you’re shopping for an allergy air purifier you want the device to be able to handle at least this size or larger. That way you’ll know it can remove the most amount of allergens from the air. Another thing you’ll want to keep in mind when buying an air purifier is the fact that it will only work in the room you have it running in. Air purifiers can’t purify air through walls. For example, if you have an air cleaner in your living room then you’ll get allergy relief in that space. But if you go to your bedroom and you don’t have an air purifier in that area then your allergies could become worse while you sleep. Ideally, you want to have an air purifier in each room of your home that you spend the most time. For most people this is the living room and bedroom. If you severe allergies and spend a lot of time in an office or basement as well, then you’ll want to consider putting an air cleaner in those locations too. The bottom line is the more rooms you have an air purifier in, the more relief you’ll get from your allergy symptoms throughout your entire house. Lastly, How Do You Find the Best Air Purifier for Allergies? Now that you know will an air purifier help with allergies and what the most important features are to look for, you’re probably wondering which products are best made for allergy relief. If you’d like to find out what your options are, check out our review of the best allergy air purifier. Summary – Can an Air Purifier Help with Allergies? Air purifiers are a great way to reduce indoor allergy triggers. To remove 99.97% of allergens, the air purifier must use a True HEPA filter. The air purifier must be sized properly so it can cover the square footage of the room you want to use it in. Otherwise, it won’t be as effective. For the best allergy relief, you’ll want an air purifier in every room you spend a lot of time in (i.e. living room, bedroom, basement, or office). What is the safest air purifier for babies? Are air purifiers a waste of money?